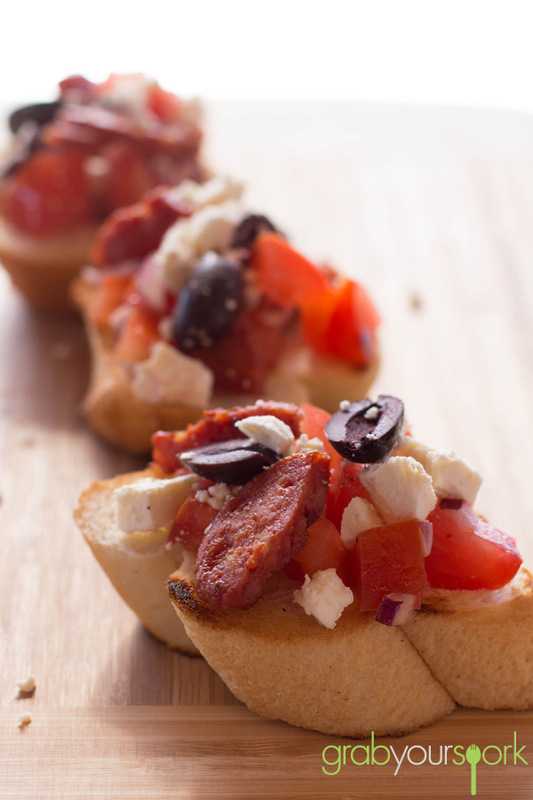 As you know I love anything snack related and bruschetta has to be one of the most simple and flavour packed snacks (or antipasto) you can make. Normally Brooke and I would make traditional bruschetta recipe with tomato, onion, basil and drizzled with olive oil. However on this lazy weekend in winter it wasn’t the best time for buying basil. 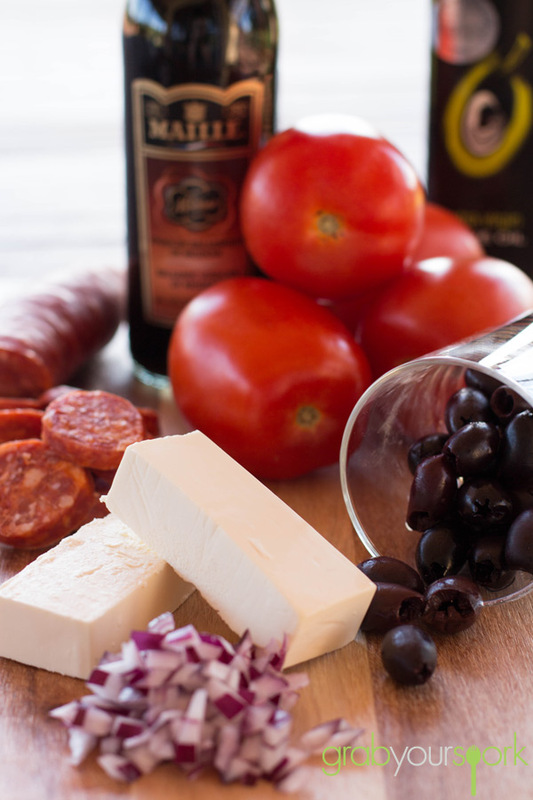 As a result, we started looking for ingredients and opted for non traditional options including chorizo, feta and kalamata olives to add with some fresh tomato and onion for a make your own bruschetta station. Now some of you may be thinking this doesn’t have any resemblance of bruschetta, however there are no rules to say what you can’t use as your toppings. However, I am sure if you love chorizo as much as me you will not doubt the flavour combinations. Now unfortunately Brooke isn’t the hugest fan of chorizo (weirdo), so to have a bit of fun with it we created a make your own bruschetta. This meant keeping some of the ingredients separate then, each of us could top ours with more of our favourite toppings. To start we diced the tomatoes, removing the seeds and mixed with some diced onion. To season we used olive oil and a dash of balsamic for a nice tang. Next we simply crumbled the feta and combined this with some kalamata olives. Lastly we cooked off some chorizo. You want to make sure you cut this small enough so it stays on the bread. To serve we lightly grilled some bread in the pan to crisp it up a little to act as the perfect carrier for this flavour packed combination. Looking for other great snack recipes then try savoury muffins recipe or baked feta with chilli recipe. 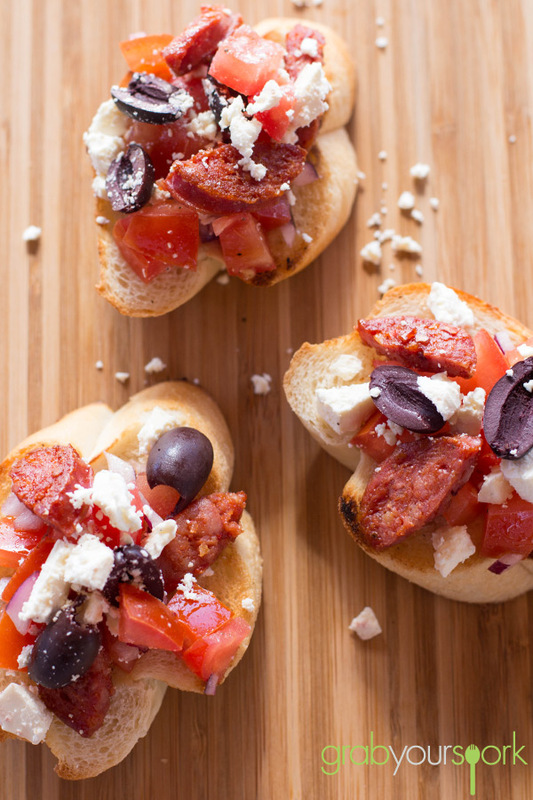 Make Your Own Bruschetta with chorizo, feta and kalamata olives. Dice the tomatoes and onion, ensuring you remove the seeds from the tomatoes. Drizzle the olive oil and balsamic over the tomato and onion in a small bowl. Crumble the feta into another bowl, and add in the olives. Be careful not to crumble the feta too much. Cut the chrizo into pieces, then cook in a preheated fry pan. To crisp the bread slightly. Toast off in a pan, or cook under the grill till golden brown. 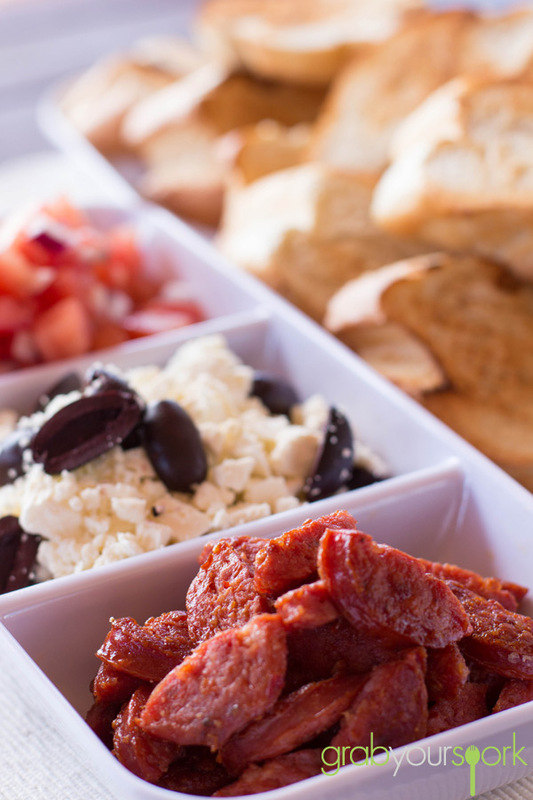 To serve keep elements separate and allow guests to build their own bruschetta. 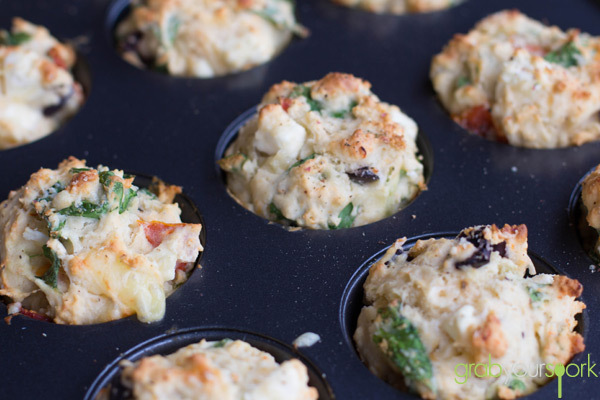 When Brooke told me that she was going to make this vegetarian healthy savoury muffins recipe, at first I was a little skeptical. Anything with the word vegetarian typically has me scrunching up my face as my initial reaction. 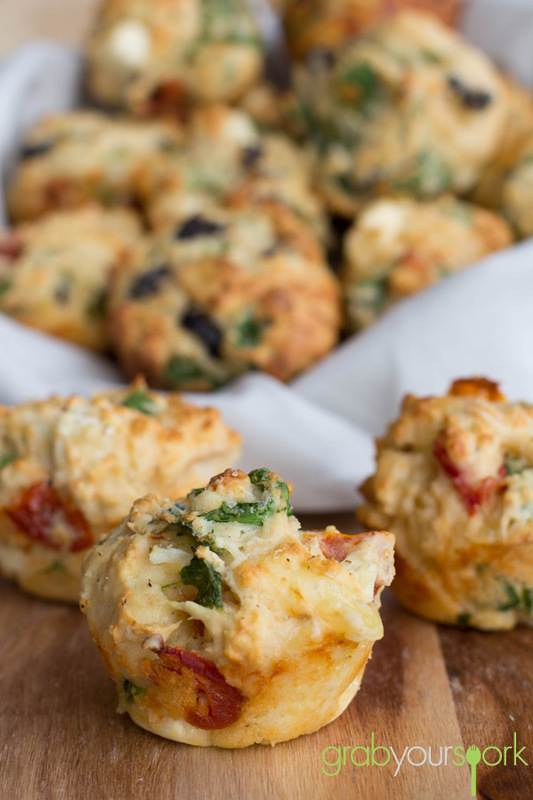 The thing was, as Brooke began to rattle off the list of ingredients including, Kalamata olives, semi sun-dried tomatoes and feta just to name a few I was quickly being won over by this savoury muffins recipe. The thing about these muffins is they are incredibly versatile, you can have them for breakfast, lunch or dinner or even just as a snack. 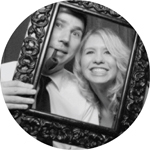 Brooke and I took them to work with us throughout the following week. Personally I couldn’t seem to get past morning tea without eating mine. However, Brooke managed to wait and have her’s with soup at lunchtime. 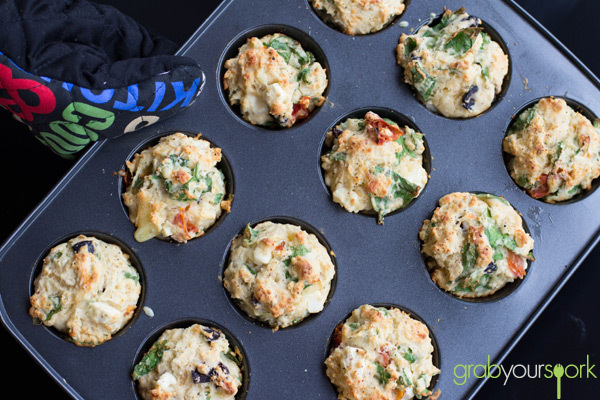 Not only are these savoury muffins really tasty, but they are also really filling and pretty healthy too. The beauty of these muffins is you can also freeze them to eat during the week or whenever you feel like a sugar-free snack. I can definitely see this healthy savoury muffin recipe becoming a go to recipe in case of a snacking emergency. Although I think next time I will sneakily add some bacon or chorizo while Brooke is preoccupied in the kitchen (Insert evil laugh). If you have a craving for something sweet and savoury muffins are not going to cut it then check our recipes for blueberry and lemon cupcakes or chocolate cupcakes. 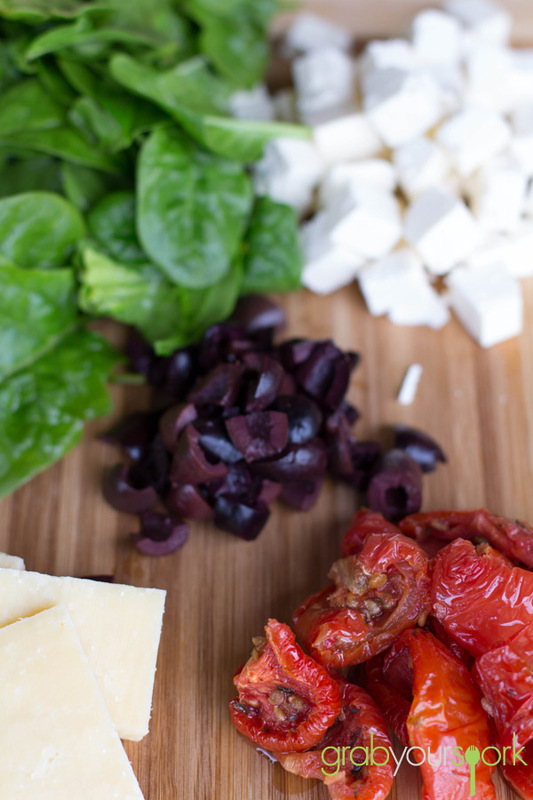 Yummy savoury muffins with Kalamata olives, semi sun-dried tomatoes, spinach and feta and more. Preheat oven to 200c and brush a 12 muffin pan with canola oil. Sift the flour into a large bowl. 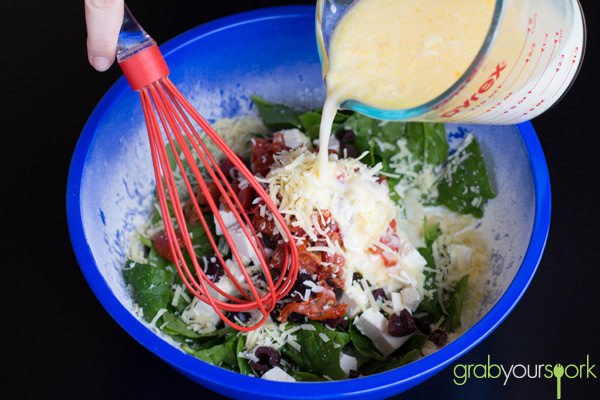 Add shredded spinach, crumbled feta cheese, chopped sundried tomatoes, olives, parmesan and stir to combine. Whisk together the melted butter, milk and egg until just combined and add to the dry ingredients. Mix together. Spoon mixture into prepared pans. Bake for 20 minutes. Turn onto a wire rack to cool. Serve warm with some butter or avocado if you prefer. Yum! 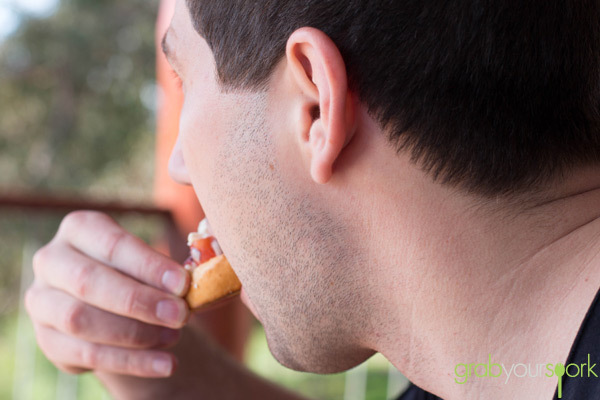 You can easily change the filling to whatever you like – bacon, corn, asparagus, fresh tomato etc.